Donning a replica of Bruce Lee’s yellow-and-black jumpsuit, Ryuji perfectly mimics the nanchaku scene from the 1972 movie, “Game of Death”. He has memorized the routine, synchronizing his every move with Bruce Lee’s nauchaku’s scene. Not only is his timing perfect but so is his acting. His facial expression is just so compelling. And you’re going to go crazy when you hear him say, “Surprised?“ He has the whole scene all figured out. His viewers on YouTube are raving about his performance. Here’s what some of his fans say about him. 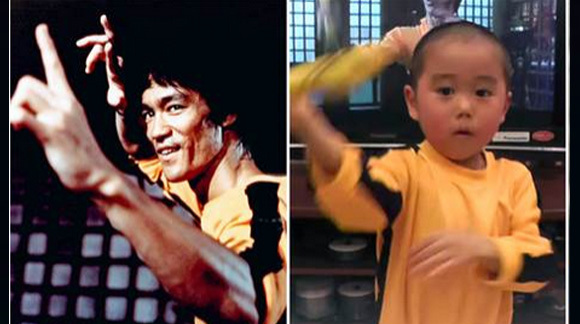 Bruce Lee is back. In a very cute way. Watch how Ryuji perfectly executes the whole nunchaku scene on the next page.